Exclusive Winter-Themed Carentan Multiplayer Map, Gun Game Mode, Double XP Playlists and Winter Siege Supply Drops Available to all Players During Limited Time Celebration. The first seasonal community event for Call of Duty: WWII is here. Running Friday, December 8, 2017, through Tuesday, January 2, 2018, Winter Siege delivers an array of activities and content for free to all Call of Duty: WWII players for a limited time. 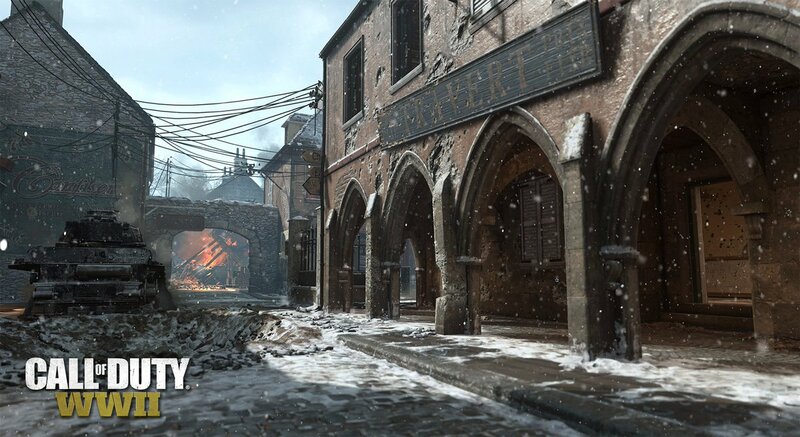 The Winter Siege features a new, frost-covered Winter Carentan multiplayer map, the return of the Gun Game party mode, Double XP Playlists, a winterized Headquarters with new visiting Quartermaster as well as new Winter Siege Supply Drops delivering new, limited edition winter gear and content to players. Winter Siege is packed to the brim for the Call of Duty: WWII community this holiday season. "The Winter Siege is all about celebrating with the Call of Duty community," said Aaron Halon, Senior Product Developer, Multiplayer, Sledgehammer Games. "There's a ton of content for everyone to play during this time from a reimagined Winter Carentan multiplayer map that's now packed with snow to Gun Game to Supply Drops full of winter-themed gear and content all available throughout the Winter Siege." The Call of Duty: WWII Winter Siege event brings the seasonal change to Multiplayer like never before. During the Winter Siege event, all players will have access to Winter Carentan, a snow-covered, winter-themed version of the fan-favorite Carentan map, previously only available as reimagined Carentan to Season Pass owners. The Winter Siege event also marks the limited-time return of Gun Game. This beloved mode makes its Call of Duty: WWII debut during the second week of the event as part of a non-stop schedule of special 2XP playlists, delivering a perfect way for players to take a variety of weapons out for a spin and keep their opponents guessing. The Winter Siege event also winterizes Headquarters, with the beach encampment taking on a seasonally appropriate appearance for the span of the event, and welcoming an all-new Quartermaster, Captain Butcher. Captain Butcher visits Headquarters bearing Winter Siege Division uniforms, cosmetic items and weapon variants. Players can earn a variant of each new weapon for free via Special Orders from Major Howard (Orders will be rotated daily to allow players to unlock a variant of each new weapon for free). Other rarity variants of these weapons are available through Collection Bounties, or in Winter Siege Supply Drops. Winter Siege Supply Drops can be earned for free simply by playing Call of Duty: WWII during the event. Players will also receive a free Winter Siege Supply Drop for logging in to play each week of the Winter Siege event. Players can also purchase Winter Siege Supply Drops using Call of Duty Points in-game currency. Base Edition and Digital Base Edition - Suggested Retail Price (SRP) $59.99. Digital Deluxe Edition - Season Pass** and more, SRP $99.99. Check local retailers for availability of all Call of Duty: WWII Editions. Season Pass content is available first on PlayStation 4. **Season Pass purchasers receive 2018 Call of Duty: WWII Season Pass content. Season Pass content is not final, is subject to change, and may not include all downloadable content available for the game. Season Pass content may not be available in all countries, and pricing and release dates may vary by platform. Season Pass content should be downloaded from the in-game store only; do not purchase separately, or you will be charged again. Season Pass content may be sold separately.